There are mainly two methods to embed your virtual tour to websites, please compress the _auto, _flash or _html5 folder in zip file in advance in order to upload to web server. If you have a web server, you can upload the zip file to your own web server and get the url link, then use iframe tag to embed the link to your website. About how to use iframe tag, please refer to http://www.w3schools.com/tags/tag_iframe.asp. If you don't have a web server, you can upload the zip file to EP-Sky http://sky.easypano.com/, our free platform to host and share your panoramas and virtual tours. About How to use EP-Sky, please refer to http://sky.easypano.com/pages/support/HowToUse.aspx. 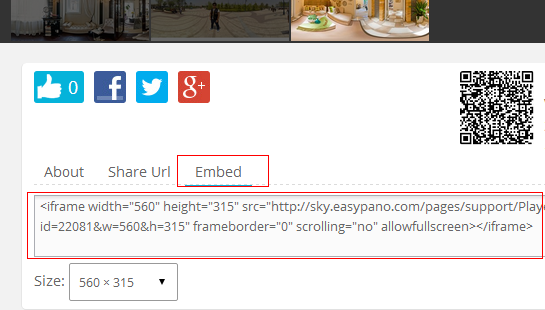 After you uploaded your virtual tour, click to open it from EP-Sky user panel, copy the iframe code from Embed option (see snapshot below) and embed it to websites. How to embed the published virtual tour to my website? How to save virtual tour project?